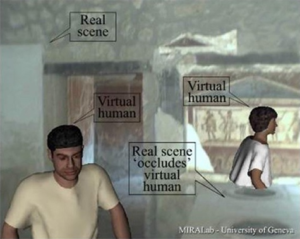 In this work, the authors identify a “content-based” shortcoming of modern Mixed Reality (MR) intangible and tangible digital heritage storytelling applications for digital humanities. It is an important problem as the very nature of these applications has often been identified with either misguided storytelling, or non-compelling, non-engaging narratives, except the initial captivating moments due to the immersive 3D visual simulation. The authors propose a new concept that forthcoming MR applications can draw from: “Literature-based MR Presence.” Based on modern literature excerpts associated with the real heritage sites, digital narratives can achieve new depths of Presence (phenomenon of behaving and feeling, as if we are in the virtual/augmented world created by computerized displays). The authors examine modern MR simulations and serious games for digital heritage and propose this conceptual framework to study them under this new concept, in order to achieve heightened feeling of Presence in the virtual heritage simulations, based on recent novel h/w advances. 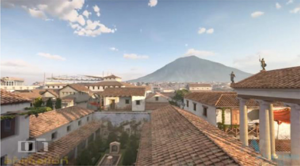 Two cases of a tangible historical place (Pompeii) and an intangible character (Salome) are identified as cultural heritage items, with associated reconstruction examples via Mixed Reality simulations and corresponding early modern literary works. 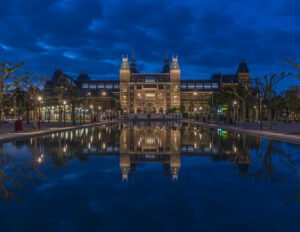 In this work, the authors present a brief overview of modern MR technologies and Interactive Learning Events (ILEs) employed in digital heritage, since they constitute the computer science part of the authors’ proposed framework. Also, the authors present the literary myth of Pompeii trying to understand how the obsession with ruins evokes the obsession with images, whereas in the second section the authors compare the literary discourse with the principle of recent MR reconstructions. Moreover, the authors focus on a historical persona, who inspired painting as well as poetry and prose, and finally the authors study the influence of the myth in an inventive, contemporary language, which translates poetry in digital terms as an example of a new shape of knowledge. The authors summarize with Conclusions and Future work, regarding next step implementations based on the conceptual framework of “Literature-based MR Presence” that the authors presented and analyzed in this work. It is impossible to imagine Pompeii without its erupting volcano and this distortion of the memory feeds every single narrative of the city life back then. So, it would not be precarious to compare the romantic mythic narrative in the Last Days with a 4D computer animation or with the computer adventure game “Time escape: Journey to Pompeii” (Figure 1). The kinetic image of the catastrophe rhymed by frightening pauses underlined with the silence and the deep dark screen transports the virtual visitor to a complete sensory experience. This tactile notion of the vision creates an access to reality, where language seems absent or reduced to a vague noise. Virtual and Augmented Reality (AR) and their concept of cyber-real space invoke such interactive digital narratives that promote new patterns of understanding. The word “narrative” refers to a set of events happening during a certain period of time and providing esthetic, dramaturgical and emotional elements, objects and attitudes. Mixing such esthetic ambiences with virtual augmentations and adding dramatic tension, can develop these narrative patterns into an exciting new edutainment medium (Foucault, 1984; Azuma et al., 2001). By employing “literature-based MR Presence” i.e., basing the dramatic storytelling on literary texts, would develop even further these narratives and prolong Presence for the end users. The abandonment of traditional concepts of static cultural artifacts with interactive, augmented historical character-based event representation based on literature is an important component of this redefinition. For such digital narratives realized with Mixed Realities (Virtual and Augmented Reality), the conditioned notion of artifact gives away to a far more liberated notion. As suspended in MR space, the visitor leaves the prison of petrified cultural heritage and emerges in a contextualized world of informative intangible sensation. In such a world, “the dream of perfect FORMS becomes the dream of information” (Tamura et al., 2001; Papagiannakis et al., 2005), as depicted in the LIFEPLUS project (Figure 2). Hence, the core notion of the conceptual “literature-based MR presence” framework is the following: Without the original experience of writing, or the authenticity of text, basically without the notion of literature, the dream of hybrid information proves a mere technological achievement2, a condensed fantasy of imagination and material reality, which however doesn't really lead the imaginary into a sharp and clear form of Presence in the reconstructed MR of the digital heritage site. If we examined Pompeii as a “placeless place” that could combine the literary and the digital myth, we would like now to extend our conceptual framework using as example another nineteenth century myth, this time not about a place but about a historical person: Herodias's daughter. Unlike Pompeii, in Salome's case we deal with a myth without a tangible historical trace. Unlike Pompeii whose historical reality becomes and survives as a post-modern myth, Salome floats between the vague boundaries of a mythic presence, which becomes historical reality. n this work, the authors have analyzed the theoretical discourse of a new concept of “Literature-based MR Presence” for digital humanities and MR digital heritage applications. The authors presented examples of the first modern novel of the nineteenth century that, in order to depict a historical catastrophe in a digital heritage site (Pompeii, tangible heritage), included images as part of its transcript. The authors also present examples of another historical figure (Salome, intangible heritage), who also has extensively being identified in modern literature, as well as digital narratives. Such is the contradictory working of myths. And as the quintessential reductive machine, the computer is employed as the device that will restore its unity through multiplicity and fragmentation. Hence, we need to consider this work as a further step toward reconciliation and a renewed mutual beneficial relationship between humanities and computer science. Cavafy, C. P. (2012). Salome, Unfinished Poems. Trans. Mendelsohn, D. New York, NY: Knopff. Foucault, M. (1984). Des espaces autres. Mouv. Contin. 5, 46–49.